The scheduled hearing on Oct. 7 for the rezone request for the $76 million Epps Bridge Centre on Epps Bridge Parkway might seem almost unnecessary. The state–at the urging of the county–already has decided to build a $26 million roadway to the project. The county, in an effort to facilitate the project, has loaned the state $5 million for right of way purchase for the roadway. The county also passed a beer and wine ordinance in April that any mall with seven restaurants and a 16-screen theater–which is what Epps Bridge Centre is supposed to contain–almost certainly needs to be successful. The county planning staff–despite a negative review of the North East Georgia Regional Development Center–recommended that the Epps Bridge Centre be approved. The county Planning Commission voted on Aug. 18 to approve the rezone request and send it to the BOC–again despite conclusion of the NEGRDC that "the development is not in the best interest of the Region and therefore the State." The BOC was supposed to hold its public hearing on the rezone on Sept. 2, but when developer Frank Bishop asked for a delay, the BOC gladly agreed. Bishop said he needed more time "to work out some design details with the planning staff." B.R. White, planning director, told me after the meeting Bishop wants to know what he will be expected to do when the rezone is approved. Even the federal government has gotten into the act. When Bishop decided he wanted to pave over–rather than preserve–the 2,421 linear feet of flowing streams and 1.06 acres of wetlands on the site, the U.S. Army Corps of Engineers gave him a permit. It even allowed him to mitigate his destruction of the Oconee streams and wetlands by repairing streams and wetlands in neighboring Greene County. The reason Oconee County is so enthusiastic about the project is the tax money it is supposed to generate. Bishop has estimated that it will generate about $750,000 each year in property taxes for the county and $4.7 million in sales taxes. With the county planning to ask voters to renew its Special Purpose Local Option Sales Tax (SPLOST) in March of 2009, retail sales are crucial. The county hopes to rake in $40 million over the six-year life of the tax of a penny on each dollar of retail sales. The SPLOST is in addition to the existing Local Option Sales Tax of one cent per dollar and the Education Local Option Sales Tax of one cent per dollar. The remaining four cents of the seven cent sales tax go to the state. Bishop has estimated that Epps Bridge Centre will have annual sales of approximately $158 million, so total sales tax revenue would be more than $11 million a year, if he is correct, and the county would get 43 percent of that, or the $4.7 million. Ever since the new western gateway to Athens was created with completion of SR 316 more than a decade ago, the county has eyed and promoted the development of the land along Epps Bridge Parkway for commercial use. The goal has been to make the corridor the new western retail center for the two counties, competing with, and perhaps overtaking, West Broad Street. Epps Bridge Centre expects to have major retail anchors that will compete with similar stores at the existing Georgia Square Mall on West Broad. To that end, the county has been promoting for a decade the proposed highway that will fly over SR Loop 10 and open up for development the land behind Lowe’s, Wal-Mart and Kohl’s. The concept plan for the 1.7 mile long roadway, then known as the Jennings Mill Parkway Extension but now called the Oconee Connector Extension, was produced at least as early as 2004 by Moreland Altobelli Associates Inc., the huge engineering firm out of Norcross. In August of 2005, Bishop bought the exact pieces of land the state had targeted for the extension as well as two of the other three pieces of land he needed for the development. He bought the final piece in 2007 and that same year swapped out some land with Georgia Department of Transportation to round out the boundaries on his property. The state has delayed the letting of contracts for the Oconee Connector Extension several times, but it is expected to do so in the next few months. Without that roadway, Epps Bridge Centre is not going to happen. Even the county agrees to that. The planning staff and the Planning Commission have recommended as a condition for the rezone that Bishop not be allowed to build more than a third of Epps Bridge Centre until the extension is completed. Bishop proposes to complete the project in several phases, beginning with site clearing and grubbing in January of 2009, according to a document he submitted to Oconee County in May of 2008. He plans to start constructing pads for the first buildings in November of 2009. The project is not expected to be completed until 2013. The mall will dump a lot of traffic onto Epps Bridge Parkway and SR 316 under any circumstance. According to the NEGRDC report, Epps Bridge Centre will generate 19,108 new Annual Average Daily Traffic units (AADT). In 2007, Epps Bridge Parkway near the development site had 27,170 AADT units. The new road is simply a semicircle allowing traffic to move through the shopping center rather than continue directly along Epps Bridge Parkway and SR 316. According to the 2004 plans, traffic also will be able to enter SR Loop 10 going north and exist SR Loop 10 coming south. What will happen to the existing entrances to and exists from SR Loop10 on Epps Bridge Parkway and SR 316 isn’t clear. The plans also call for construction of an access road that will dump traffic onto Jennings Mill Road, which borders residential neighborhoods in Clarke County before intersecting with West Broad Street in Athens across from the Logan’s Roadhouse restaurant. This already is a confusing and congested intersection near an exit ramp from SR Loop 10 onto West Broad Street. 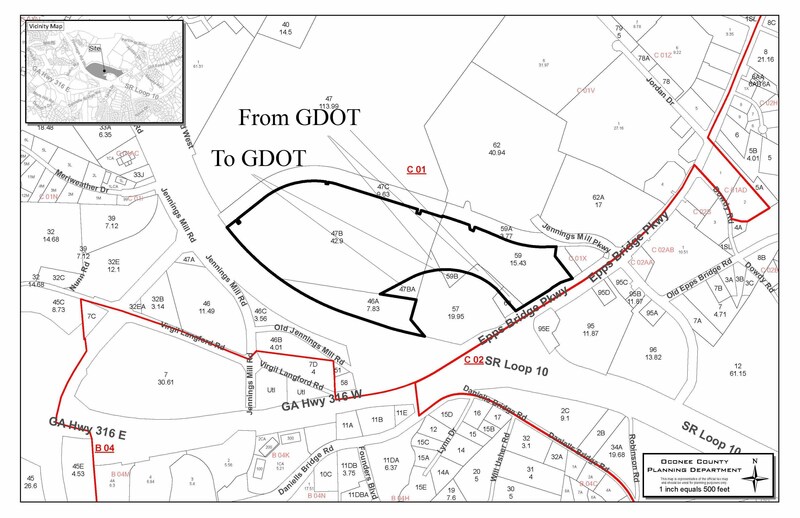 One positive feature of the Oconee Connector extension is that it will contain sidewalks and bike lanes, according to a Narrative Bishop submitted to the Oconee Planning Department with his rezone materials on May 07, 2008. Epps Bridge Centre does not include bikeways as part of its traffic plan. At build-out, 70 percent of the land at Epps Bridge Centre will be covered with impervious surface, including lots of parking spaces, according to the NEGRDC report. In fact, Bishop’s concept plan shows 2,905 parking spaces, which he says is 17 percent more than the 2,483 required. That concept plan shows a long strip mall with four clusters of building and 15 self-standing buildings, including the 16-screen movie theater. The four clusters are designated for anchor stores. How precisely Bishop has estimated the tax revenue the mall will produce for the county is hard to say. So far, he has not been asked in a public meeting to explain or justify the calculations. According to the NEGRDC report, Bishop has estimated it will cost the county only $55,498 annually to provide community services associated with the project. Given that Epps Bridge Centre is intended to be an entertainment complex with the restaurants and theater, the county will have to assume some security costs as well as costs associated with administration and enforcement of the beer and wine ordinance. Alan Theriault, administrative officer for the county, told me in an email message of Sept. 8 that one entry-level deputy sheriff currently gets paid a minimum of $29,956. Benefits and other personnel costs are in addition to that, raising questions about the $55,498 estimate. A common statement among government leaders in Oconee County is that development is inevitable. All they can be asked to do is manage it. In fact, BOC Chairman Melvin Davis claimed on the small, folded business cards he passed out during the July primary election that one of his accomplishments was that he "Effectively managed county growth." Davis has done much more than manage this development. Davis was the force behind the beer and wine ordinance, making sure it came to a vote and voting in favor of it to break a tie when two of the four other commissioners opposed the ordinance. County officials reporting to Davis also have taken credit for working with State Representative Bob Smith to make sure the funding has come through for the roadway Bishop needs for his shopping mall. When Bishop sent an email message to Brad Callender in the Oconee County Planning Department on Sept. 17, following the BOC meeting on Sept. 2, he copied it to Davis, thereby making sure Davis was in the loop. The email offered Bishop’s defense of the criticism the project had received from NEGRDC. The BOC seems likely to vote in favor of the rezone for Epps Bridge Centre, if not on Oct. 7, then at a later date. The citizens of the county are being given a chance to voice their opinions at the public hearing on Epps Bridge Center only after a long series of decisions by the county and its leaders promoting this development.